Josie is truly one of a kind. As North Town’s original Pet of the Month, Josie is very happy to still be going strong three and a half years later! 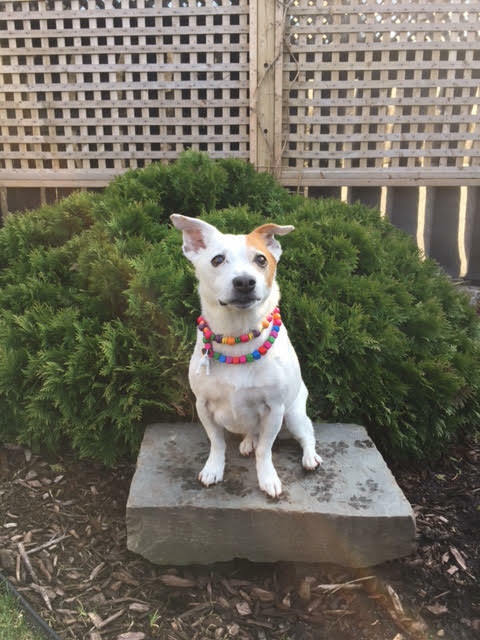 Josie’s story was featured in the Pet of the Month blog that first launched at North Town in early 2014. Josie shared her story of strength as she embarked on her journey of battling cancer. You can find where her journey began here. Josie’s diagnosis of lymphoma at North Town Veterinary Hospital in late September of 2013 did not have a good prognosis. With chemotherapy, the average life expectancy is 13 months, or approximately 25 chemotherapy treatments. Without chemo, she would only have about one month to live. Josie however, has exceeded all expectations and is not only still with us, but is thriving and you would never even know that she has cancer! A lot has changed since 2013, but Josie, along with her parents, Irene and Joe, still go for their many walks on the Bruce or Trans Canada Trails, even though they may not go as far or as fast as they used to. They have also started going for regular treatments at the Mississauga Oakville Veterinary Emergency Hospital (MOVEH), as it is much closer to them than the Toronto Veterinary Emergency Clinic (VEC). Even though they are no longer going to VEC for regular visits, they are incredibly grateful to them for getting Josie started on the road to success! In defying the odds, as of April 2017, Josie has had a total of 79 chemo treatments! Irene and Joe can count on one hand the number of times that she has had side effects (a slight case of vomiting or diarrhea) from those treatments. All of the medications they have given Josie to counteract any side effects had to be disposed of because they have reached their expiration dates without being used. Because of the numerous amount of chemo treatments that Josie has gone through, one of our technicians, Rebecca Lamont, surprised Josie with a beaded necklace. For those who don’t know, beaded necklaces (sometimes called Bravery Beads), are given to children at Sick Kids who are diagnosed with cancer. Each bead represents a chemo treatment that they have fought through, and for every additional treatment, a bead gets added to the necklace. With Josie having gone through 79 chemo treatments (and counting! ), you can only imagine how long her necklace is! Irene, Joe and Josie were all incredibly thankful for the kind gesture from Rebecca, and now she wears it as a symbol of bravery everywhere she goes! As Josie’s longevity is somewhat groundbreaking, Irene and Joe feel quite confident due to the fact that along with her chemo treatments, she has been dealing with a complimentary holistic regimen. Irene believes that there must be some merit to this because, at the hospital in Ottawa, where people receive chemo, the holistic department is right there alongside the chemo department. Irene feels very strongly that Josie would not be in the great condition that she’s in now if it weren’t for her Holistic Veterinarian, Dr. Sharon Kopinak. As Irene says, Josie would not be here without all the exceptional professional care, kindness and love she has received from all of the veterinary hospitals that she has been going to for the past few years. Josie’s treatments have been worth every cent, and they will continue with them for as long as Josie is not only living a longer life but a quality life. The only people who will decide when “it is her time” will be her trusted professional caregivers, to whom they are eternally grateful. All of the staff here at North Town wish Josie and her family all the best! Update: Since the writing of this blog, Josie started declining quickly and the chemotherapy stopped working and began giving her side effects. Sadly, she passed away on June 10 surrounded by her loving family. Unfortunately, cancer is very unpredictable, but we are just glad that Josie got to have nearly 4 more great years in this world due to the excellent care provided by her various veterinarians. She made it to 85 beads, still unheard of with the specialists. We wish her family all the best. My Pet Can’t Have Worms… RIGHT? !